Violent Masked Leftist Attacks Conservative Speaker Knowles at MO Speech -- Cops Take Him Down -- Leftists Chant "Hands Up, Don't Shoot!" 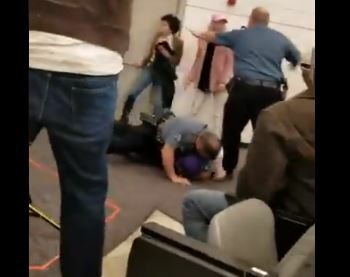 A violet leftist attacked Republican Michael Knowles during his speech on Thursday at UMKC in Missouri on Thursday. The masked attacker sprayed an unknown substance at him during the attack on stage. Police quickly moved in and took down the far left criminal. So the leftists in the crowd stood up and screamed, “Hands up, don’t shoot!” at the police officers in reference to Ferguson’s Micheal Brown who DID NOT have his hands up when he was gunned down in 2014. This is the thought process on the American left today.